GREG JOHNSON NOW ONE STEP AWAY FROM THE O2! Talented young singer/songwriter Greg Johnson’ is now just one step away from playing within The O2 in London after impressing the TeenStar competition judges at the Regional Final in Bournemouth on 14 April 2013. 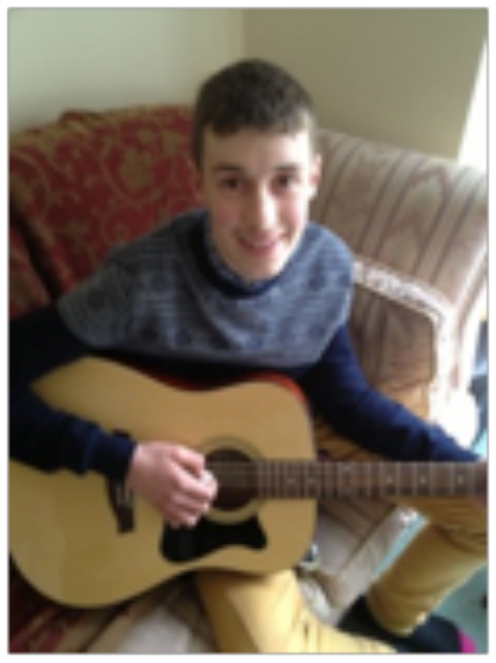 Greg, aged 14, has now made it through to the Area Finals at Portsmouth Guildhall this Saturday 18 May, and is one good performance away from playing within one of the greatest live music venues in the world. TEENSTAR is an exciting national talent competition run by Future Music which searches for the UK’s best teens and pre-teens singers, singer/songwriters, rapper and vocalists of all genres who perform either covers or original material. More than 9000 hopefuls entered TeenStar in its first year. The competition has music industry judges attend every stage from auditions to the National Grand Final. Past judges for Open Mic UK include Radio 1 DJ’s Ras Kwame and Annie Nightingale MBE and KISS FM’s Charlie Hedges. Mario wishes Greg every success in the Area Finals and hopes that the next time Greg gets a ride he’s one of Mario’s VIP guests! 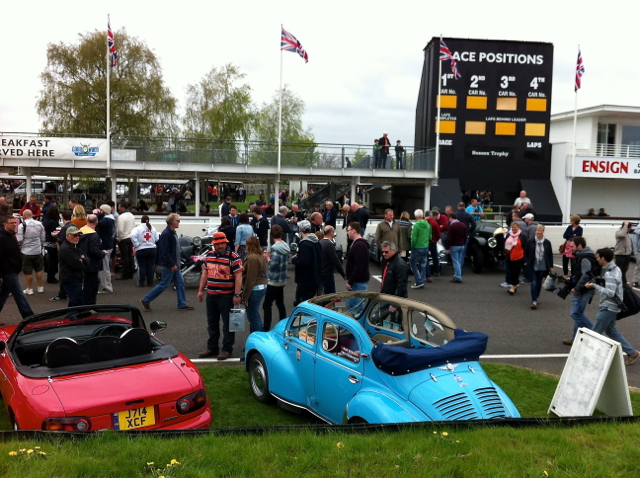 Sunday was the Breakfast Club at Goodwood, the theme was ‘Soft Top Sunday’ so poor Mario was left at home sulking and brother Regie the 4cv Convertible was taken on a outing. For a bank holiday weekend the weather was good and we made the trip roof down – it was lovely to feel the wind in your hair and it was much warmer than the photo’s look! Sorry if the pics are a bit ropey but the camera is being repaired at the moment so these are taken on the iPhone – better than nothing. 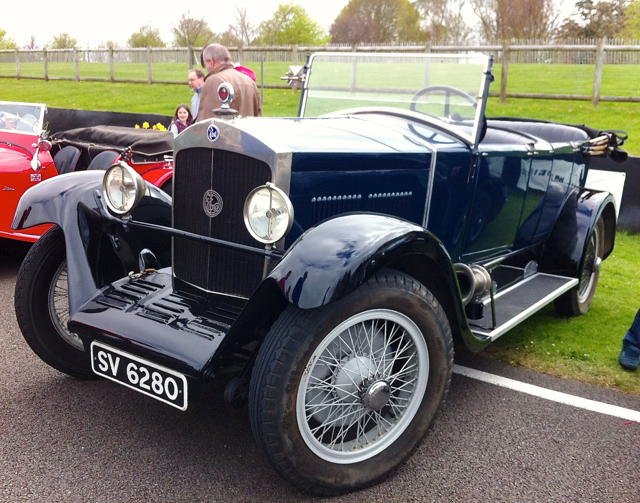 A great blast down through Midhurst and over the downs to the Goodwood Motor Circuit, Regie has a 850 Dauphine Gordini engine and 4 speed box fitted, so goes very well, sensible for keeping up with modern traffic and great acceleration! With the countryside finally turning green it was a beautiful trip. Now the humans aren’t too good at getting up early and so we never make it to breakfast club by 8am when the gates open but when we arrived about 9.15 or so the traffic had cleared and we drove in and straight onto prime position at the end of the grid. We couldn’t have had a more prominent position especially as this was the last breakfast club before the Haslemere Classic Car Show which we organise. Regie was very popular with the crowd and we were able to hand out lots of fliers about the show and the Bake-off cake competition which is this years new feature in keeping with the show’s traditional feel. We’ve been supported by Kenwood and the lure of winning a K-mix stand mixer worth £399.99 will hopefully be a great draw. Soft-Top Sunday is a very wide theme, there were lots of modern convertibles which had no real interest to us – you can see most of them in Tesco’s! 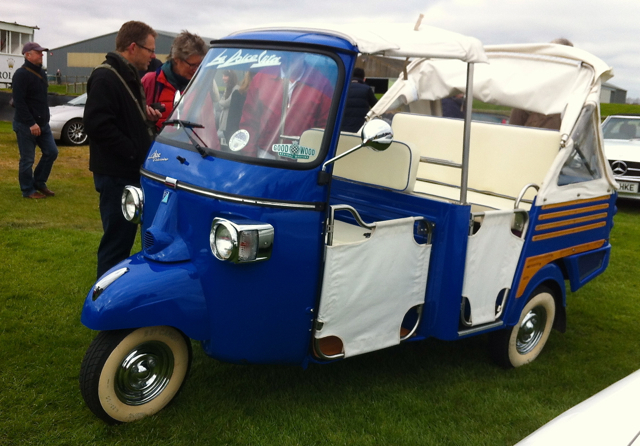 A good collection of classics were in attendance though, we loved the Piaggio Ape, although it’s fairly new it looks so retro. 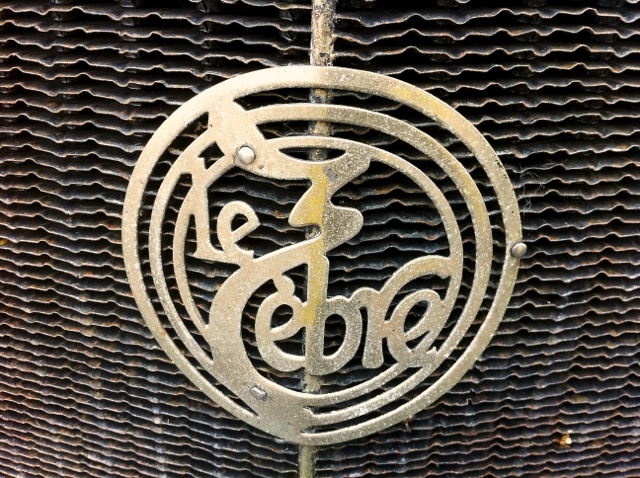 The badges were beautiful, unfortunately I know nothing about the car, I guess it’s French and google has so far drawn a blank. 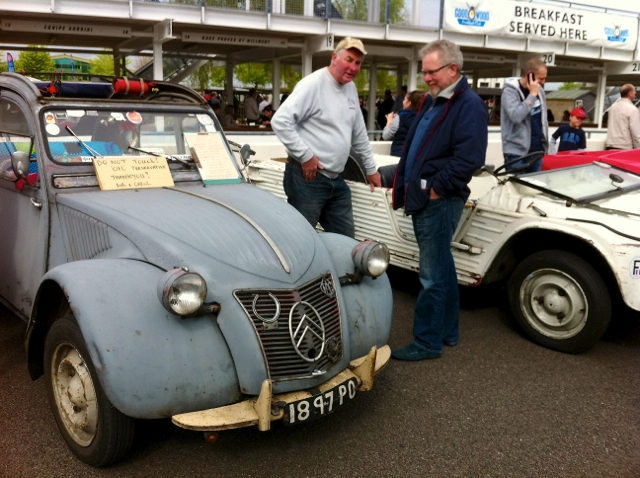 James loved this rather ‘sheddy’ Citreon 2cv and the Mahari, looks like they are coming to the show at the end of the month with some of their mates. 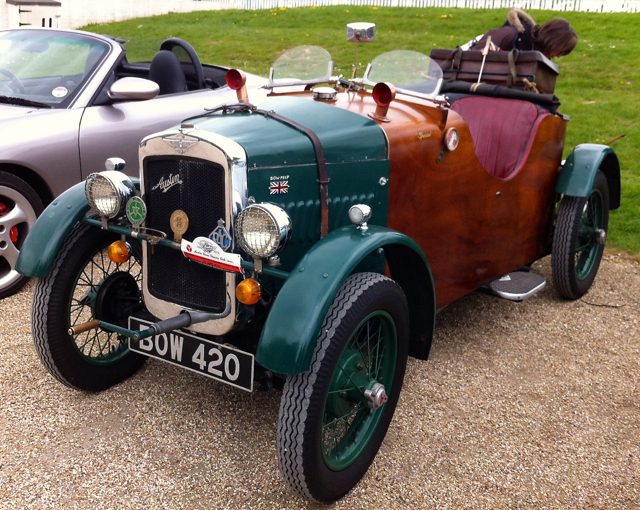 This little Austin 7 had a wooden body and was very cute and quirky. 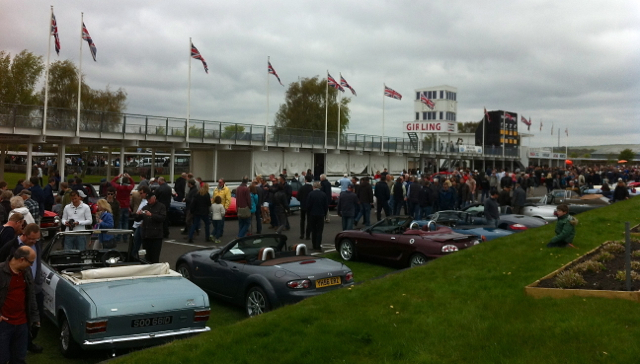 This was the busiest breakfast club for a while and themed cars were parked all along the circuit, the paddocks and the outer perimeter. We haven’t taken Regie to the Breakfast Club for ages and forgot how much interest he generates and that not many people know what he is. 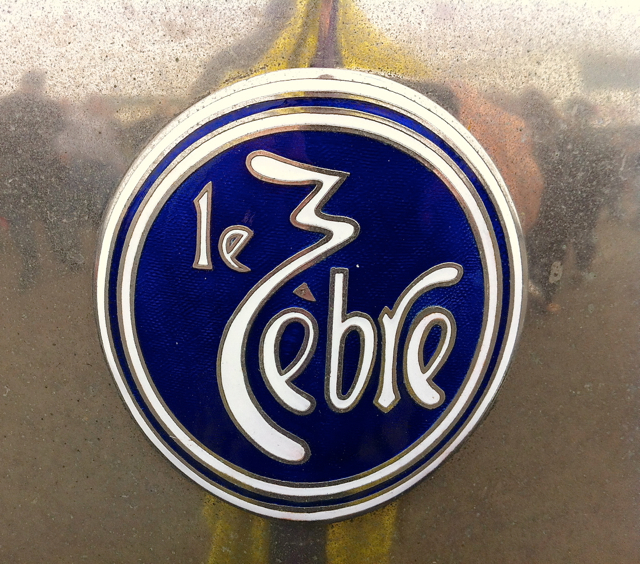 There are no Renault Badges to be seen – the front just has a diamond with RNUR which stands for Régie nationale des usines Renault although not many people know that! A few clever people look at the tax disc but most just ask ‘what is it’? 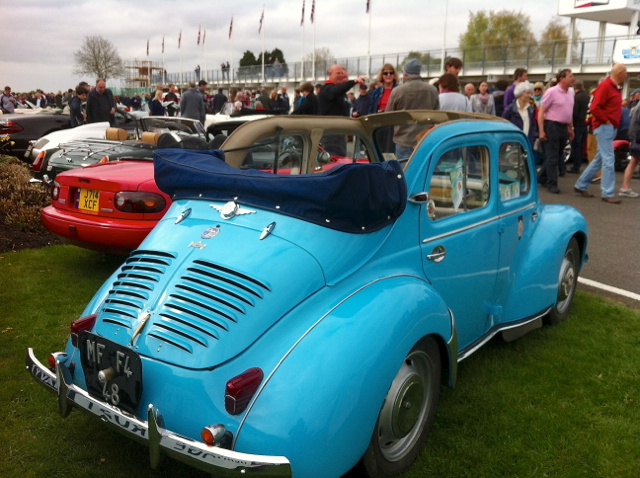 With the ‘Beatle’ type back and Morris Minor front it always causes lots of confusion. 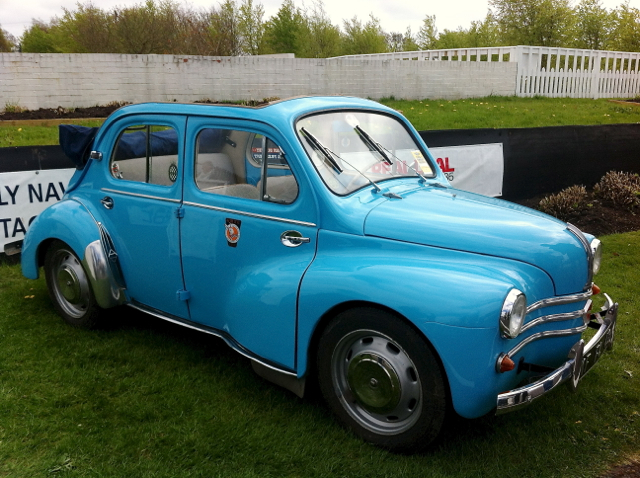 Although more than a million 4cv’s were made in France, the ‘people’s car’ was only made in the UK in small numbers and the Renault 750 as it was known here was relatively expensive so these days there are very few in this country.